Knave/Assassin: Low stats, high chance to get critical hits. Barbarian/Barbarian King: A walking tank. Low damage output. Mage/Arch-Mage: -50% health, +50% mana. Each Kill gives you mana. Shinobi/Hokage: Low defense and HP. No critical hits. Extra high damage. Lich/Lich King: Starts weak but gains health with every kill. Miner/Spelunker: Very low stats, but everything gives you more gold. Spellthief/Spellsword: Steals Mana from enemies with each hit. In addition to being randomly selected from each Class, each character has a few traits. These can be seemingly useless things like a compulsion to curse every time you're hit, no peripheral vision (which doesn't affect a side scrolling game), or being a savant at something to being really serious. The more serious traits your character can have are a great memory (allowing you to remember how many enemies are alive inside every room you've been to on the minimap), be nearsighted (making everything far off extremely blurry), have Alzheimers (which means you don't get a minimap because you're generally lost), be balding (which the game will ebb at your sanity regarding), or just eb adb ta spllenig tinhgs (wihch jsut srot fo cmopicaltes thngis). In addition to your random class and traits, your character choices also come with a unique weapon (daggers, axe, watch, scythes, etc. ala Castlevania). After picking the 1 out of the 3 randomly generated descendants you want to play as you enter the castle, which is constantly rearranging itself. I don't just mean that you encounter the same rooms in a slightly different arrangement, I mean that everything completely changes every time you enter, meaning that though you can upgrade your character using the gold you found on the previous run through the castle, and though you have awesome gear, you're now going through unknown territory. Far from the entirely unenjoyable experience of Ghosts N' Goblins in terms of difficulty I'd say that Rogue Legacy is no more difficult than a typical SNES side-scroller. It's fluid, the controls are very responsive, and the niche-upgrade system can cater to your personal style of gameplay. For instance, I never use Magic Items, I love using the triple-jump and levitate runes, and I constantly upgrade my sword because I want to do as much damage with each swing as possible. In an odd way the customization reminds me of Demon's Souls or Dark Souls, only with a sense of humor and references to Batman, Skyrim, and a dozen other things I won't spoil. "Freedom": This game is as free as an exploration-based side scrolling game can be. You can fight bosses in any order you like (though you'll likely get schooled), you can upgrade your character in any ways you'd like (visually represented in the form of a castle), and there are countless little freedoms you'll notice while playing the game. For instance, a character known as "the Architect" will allow you to go through the same castle you went through (meaning the rooms/monsters are the same configuration) in your most recent playthrough at the cost of 30% of your earnings this time through. Noticeably the castle always seems to take into account what abilities/gear you have so there's almost no need to ever backtrack. Everything also completely rearranges the next time you enter the castle so there's also really no way to backtrack. Portraits that resemble Paladin Lobos from Lords of Thunder! Art/Music: The music was the initial reason I was pulled into this game so I'll vouch that it's extremely enjoyable. The SNES-era style character and bright flashing numbers indicating damage (ala Cave Story) were also things I greatly enjoyed. Should you want to check out the soundtrack, which I highly recommend, you can do so on the game's bandcamp page. There are a lot of silly Easter eggs for you to find in this game that you'll likely appreciate. Everything from Nerdy Glasses (that fix being nearsighted) to Santa Clause. There is also a diverse array of enemy types, attacks, and minibosses. The Bad: If you're looking for a really deep plot you're a bit out of luck as this is a generally carefree game. Luckily I wasn't. 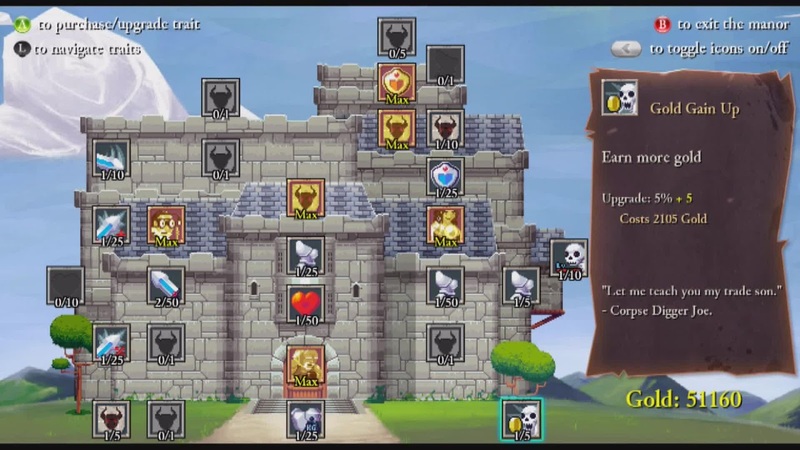 My only complaints with Rogue Legacy are that some of the upgrades are kind of expensive the further along you get. It's probably balanced, I'm just not used to "leveling" in an action-adventure game (at least not since Kingdom Hearts) and found that the rising upgrade prices tended to be tiresome after awhile. Some of the randomly generated maps were also particularly cruel, bordering unfair based on my gaming style or the class. Just the same the unfair parts of the game were completely gone by the next playthrough. Closing Thoughts: I very much enjoyed Rogue Legacy and highly recommend it.